Greetings to all our Village plant enthusiasts. Welcome to the latest “Plant of Interest” article for 2016! This week we’ll be looking at a member of the Hyacinthaceae (Hyacinth family). 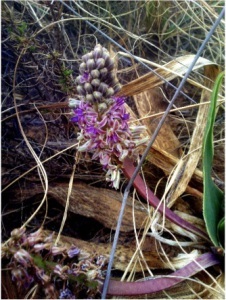 Ledebouria revoluta (Common Squill/ in English, Bokhoe in Sesotho) is a perennial herb of up to 15 cm metres and occurs in bushveld and grassveld from the Western Cape through to KZN to approx. 2100 m A.S.L. Growth is best in the shade of trees along streams and on rocky slopes in the grassveld areas. The distribution is largely summer rainfall but also includes winter rainfall areas. The specimens pictured here were photographed on the Spruit trail where they prefer partial shade. The species seems to fare better in moister areas where it occurs in a darker green variant. Ledebouriarevoluta belongs to an interesting group of succulents with Epigeal bulbs. The word epigeal is derived from the Greek Epigiaos , Epi meaning “above” and Gia referring to Mother Earth, thus “above earth” or “above-ground”, with only the root system anchoring the plant to the soil. These plants thus germinate above – ground in contrast with the majority of plants. As the common name implies, L. revoluta is regarded as the most common species within the genus. It persists for elongated periods in moister areas, but is deciduous in the drier parts of the grassveld and is thus relatively frost tolerant. The genus Ledebouria was believed to be closely related to the genus Scilla or Merwilla; however this has now been proved a distinct genus. Huge variability in morphology has been observed for this species, likely as a result of ecological adaptations throughout its broad distribution. This is interesting in itself, and further studies will be required to ascertain whether these are actually sub-species within the genus. 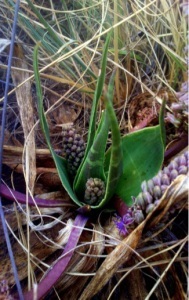 The leaves of the Common Squill are lanceolate, and tapering at the points from a broader base when between 1 and 20 leaves may be fully developed by flowering season. These are a dull green (and may be rolled inwards) and often marked by purple or darker green dashes throughout the length of the leaf. The leaves envelop the bulb in a basal rosette. 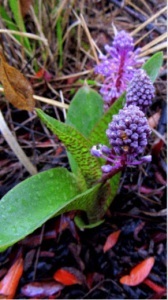 The inflorescence is a raceme and are held aloft a purple-grey stem. The flowers are small and bell-shaped, measuring around 5mm in diameter and are a purple-grey colour with deeper purple/magenta stamens. These in turn are held in clusters on short stems. Flowering occurs from September – January. Regarded as an ethno-medicinal geophyte, a plethora of medicinal uses have been attributed to L. revoluta, including use during pregnancy; as an antiseptic for wounds; itches and scratches; in the treatment of diarrhoea and flu and for back pains. Antimicrobial, anti-inflammatory and free-radical fighting properties have also been researched for the species utilising crude root extracts. A multitude of insects (including bees and butterflies) visit the flowers in spring for their nectar, thus fulfilling a role in the annual pollination cycle. Classified by SANBI as of Least Concern (LC). Townlands Dam is looking full!! !